Handmade or cold-process bar soaps, (when properly made and formulated) are THE MILDEST soap product that can be made in any form. 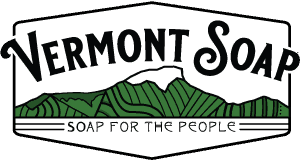 At Vermont Soap we make a true craft handmade bar soap in the quantities and quality that will meet your needs. Handmade soap is aged for nearly a month on oak and stainless steel screens before it is ready to use. The result is what we call it the “hand lotion in soap effect” – skin feeling clean but not stripped out. Our cold-process soaps are ideal for people with sensitive skin. If you are considering expanding your line of handmade soap for sale, outsourcing your in-house bar soap production, or you have a cool soap idea and are looking for a reliable factory to work with, give us a call! Our cold-process soaps are palm oil based. We add palm kernel, olive and coconut to round out our base. We have many in-house stock scents and size options available. We can easily add YOUR specialty oils, botanicals and scent blends* to our great bar soap base. Batches of handmade soap are all in multiples of 850+/- bars. We offer several common bar sizes and thicknesses to customize your look. We can package your private label organic bar soap in a variety of sizes. Please see our Private Label FAQ page for more information or contact one of our private label specialists. Need USDA Organic Certification? Vermont Soap can do the organic certification paperwork for you! *Please know that we prefer not to work with artificial scents as ambient scent can bleed into other products.